« Coal Export Terminal Nixed; Now What? 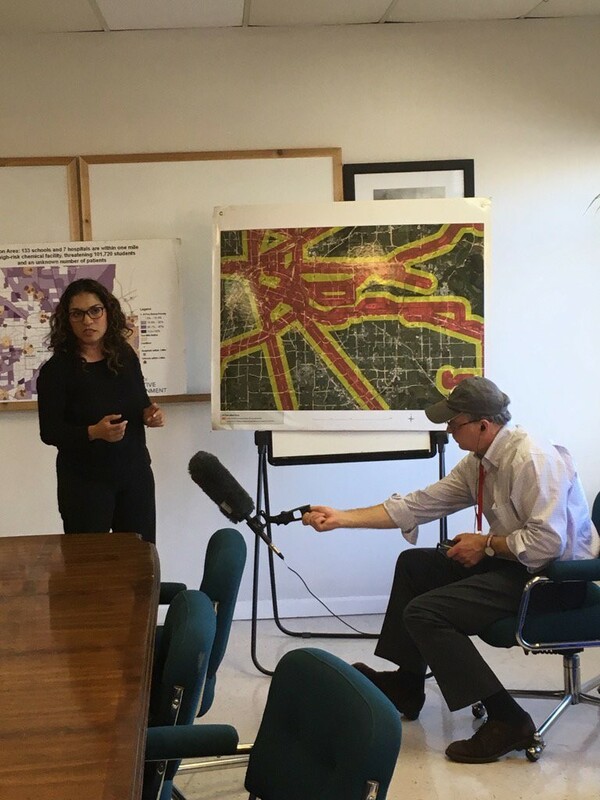 The Healthy Port Communities Coalition (HPCC) kicked off the week of action on July 6th with a press conference and a community meeting to discuss the risks that we Houstonians face as a result of rail traffic within our communities. This was especially poignant as less than a week earlier, on June 28th, two trains collided near Panhandle, TX, leaving 1 employee injured and 3 employees presumed dead. Fiery and fatal incidents over the past few years have increased concerns around rail, public safety, and chemical security, and we shared our concerns with media (“Exigen a autoridades frenar la contaminación por el transporte de combustible” and “Crude-by-Rail Plummeting In Texas But Critics Insist Risk Of Accidents Remains“) and with community members. From our discussion, community members wanted to find out more information about exactly what kind of chemicals are transported through their neighborhoods to better understand the risks. The HPCC is taking a stand against oil trains because we are concerned with hazardous, flammable materials coming into the Houston area. 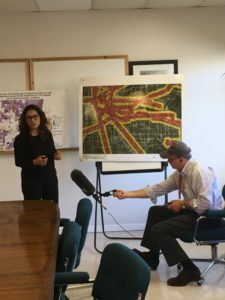 Toxic trains put Houstonians at risk through the possibility of explosion and by polluting the air with cancer-causing diesel and other toxic gases, through collisions, and by trapping folks behind stalled trains. One person reported being trapped behind a train for 90 minutes! HPCC members at the 1-45 banner drop. 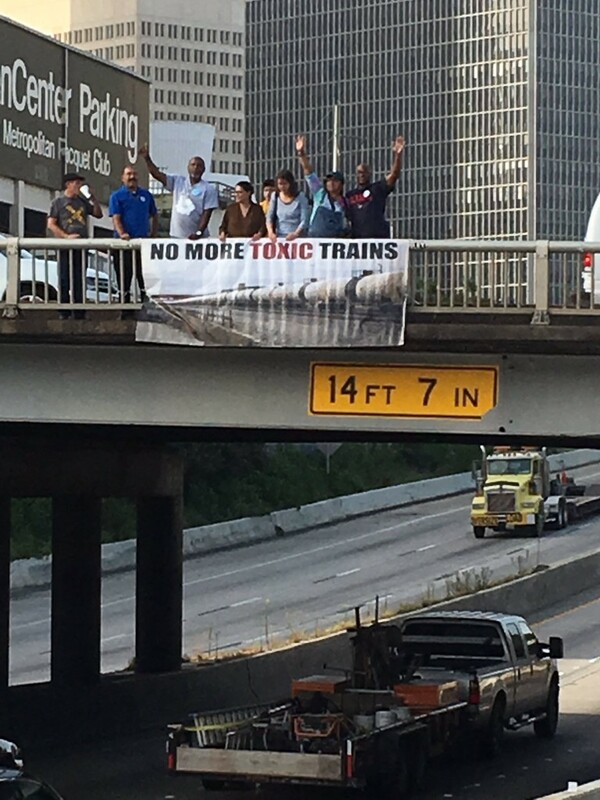 On Monday morning, members of the Healthy Port Communities Coalition (HPCC) displayed a “No More Toxic Trains” banner at the Dallas Street Bridge over I-45 near downtown Houston to bring greater awareness to the risks of toxic oil trains to the motorists passing through. In the hour that we were there, we spread our message to over 3,600 vehicles and many more passengers. 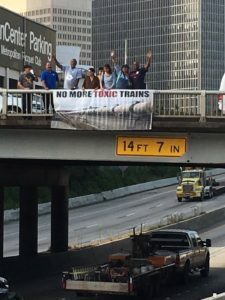 Afterwards, we walked to City Hall to advocate for Houston Mayor Sylvester Turner to deeply examine the risks we face from toxic trains by forming a task force comprised of individuals from impacted communities to study this issue further. The Stop Oil Trains Week of Action is a North American campaign hosted by STAND (formerly Forest Ethics) that takes place each year to commemorate the loss of 47 people killed by an exploding crude oil train in Lac-Mégantic, Quebec and to call for the end of the use of trains to transport volatile crude. As the week of action ended, an explosion at a fracking site in New Mexico highlighted the volatility of crude. While again this incident did not involve rail, the explosion reminds us of the need for safety in order to build a healthy future for all.